Vitamin C is something that is considered to be a powerhouse. While it does a great job at keeping colds at bay, it is also fantastic when it comes to skincare. Products that contain vitamin C are known to have some amazing results. These products are great for anti-aging, for instance, it can lighten visible sun damages and reduce scars. Likewise, it is an antioxidant, so it can protect the skin against environmental damages that are caused by free radicals. When you search the market, you will find that not many products come with vitamin C. It is also important to note that amongst them, the quantity of the vitamin and its overall quality is suspect. That is why the Vitamin C Daily Facial Moisturizer by TruSkin Naturals is great. TruSkin Naturals is a company that has a passion for creating high-quality skincare products which go hand-in-hand with the steadfast devotion to its customers. All of their products feature key nutrients, antioxidants, and botanical actives. These formulas that are richly concentrated help in correcting, protecting, healing, and restoring the skin for a visibly healthy and enhanced complexion. This facial moisturizer by TruSkin Naturals is a white cream that is a tad bit of the thicker side. So, you need to take only a little of it and apply it all over the face. The cream blends in the skin quite easily, and by using such small quantities, it makes the product last for a long time. When it came to applying this facial cream, we found the whole process quite easy. The cream comes in a tube which makes it quite easy to dispense the exact amount that you need. This tube comes with a cap with a flat head which will allow you to store it standing up on the counter or inside your cabinet easily. The drying time for this moisturizer is where we were a bit disappointed. The moisturizer takes some time to fully get absorbed by the skin. For those looking for a fragrance-free facial cream, you will be pleased with this product. The cream has no aromatic smell. It does not have a bad smell either. This facial cream is supercharged blend with a whopping 15% vitamin C along with other potent antioxidants that combine with vitamin B5, pure organic jojoba oil, MSM, and green tea for a lightweight and ultra-effective night and day facial moisturizer that is ideal for all skin types. This facial moisturizer by TruSkin Naturals is a gentle and perfect solution for those with several skin issues. This product is free from paraben, corn, and soy. Likewise, the processes used are cruelty-free and it is made from a vegan formula. This facial moisturizer can be used either as a day face lotion or as a night cream. You can also use it as a spot remover or a corrector wrinkle cream which can lift and tighten the skin around the forehead. Upon using this facial moisturizer, your skin will definitely feel a whole lot softer and moisturized. That being said, it does leave this light waxy feeling on certain areas of the face which is not the best thing. As mentioned earlier, vitamin C is considered to be a powerhouse antioxidant. This has a ton of benefits of the skin. For starters, it can help in brightening the skin tone and reducing the damages from the sun, such as sun spots, dark spots, hyperpigmentation, and age spots. This vitamin can also effectively boost the skin’s natural sun protection. Additionally, it helps refine the skin’s texture and fade the look of the wrinkles and fine lines. TruSkin Naturals is not your regular skincare company. They offer excellent after-sales service through their customer care. So, if you are not satisfied with the cream, simply shoot them an email, and you will receive a 100% refund for the moisturizer, no questions asked. 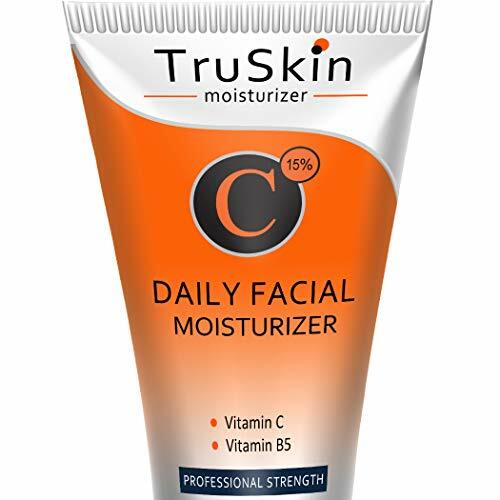 The TruSkin Naturals Vitamin C Daily Facial Moisturizer is an amazing face cream that has some high-quality and highly effective ingredients. Vitamin C, along with several other organic ingredients does an excellent job from protecting the skin against the harmful effects of the sun and environmental stress. Even though the cream has a thick texture, it blends quite effortlessly into the skin. Additionally, the cream is free does not contain fragrances, parabens, soy, and corn. It is also cruelty-free and vegan-friendly. To fully know that you are getting the best product, it is essential to compare it with another similar product. We found that the Vitamin C Face Cream by Pink Rex to be a close match to the TruSkin Naturals Facial Moisturizer. On the surface, both these products are facial creams with vitamin C in them and claim to offer similar results. Upon digging a bit deeper though, we found that the Pink Rex cream isn’t as effective as its counterpart. For starters, it does not contain the same amount of vitamin C and other powerful antioxidants. This cream also comes in a tub, unlike its counterpart which comes in a tube. So, it is not exactly the most convenient to travel around with. A good facial moisturizer is a must have for a good skin routine. If you are looking for one of the best, then the Vitamin C Daily Facial Moisturizer by TruSkin Naturals is exactly what you need. This cream contains a high percentage of Vitamin C and several other ingredients which do wonders for the skin. We highly recommend you try this one out!